Check Dunham’s Sports Weekly Ad Sale, valid April 20 – April 25, 2019. View Dunham’s Sports Coupons, best deals, and sale on: Super Flite Basketball; Crusader Spinning Combo; Men’s or Women’s Micro G Strive Crosstrainer; Under Armour Running Shoes; 6″ Direct Attach Men’s Workboot; Premier Series Softball Gloves; Youth Clean-Up Pant; Vapor Select Bat Pack; Ladies Short Sleeve or Sleeveless Tech Polo; Men’s Casual Shorts; Cobra FLY-Z Golf Driver; Fila Running Shoes; Nike Covert 16 Men’s Irons; Nike Lunar Mont Royal Golf Shoes; DiamondBack Outlook Series Bike; Under Armour Short Sleeve Tech Polo; Columbia Redmond Mid Waterproof Hiker; Covert 2.0 or X Hot N-14 Driver; TPS Lightweight or Super Lite Stand Bag; IT9300 Inversion Table; High Timber Men’s, Ladies’ or Girls’ Bike; 5 Seat Paddleboat with canopy; and more. 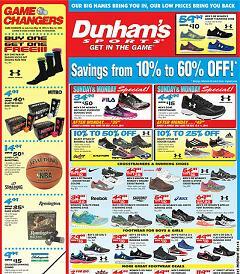 Find all deals, offers and prices in the latest Dunham’s Sports Weekly Sale Ad Circular.